From banking to remittance and payments, to creating new medium of exchanges, Islamic financial institutions worldwide are exploring ways to apply blockchain technology to optimize and further democratize Shariah compliant financial services. IFN Fintech takes a closer look at what may very well be the first blockchain use case for Sukuk globally. It did not take long after Martin founded Blossom Finance via the California-based Boost VC incubator program in 2014 for him to relocate his start-up from San Francisco to Jakarta. In 2015, it became one of the earliest, if not first platforms, to allow investors to invest in microfinance institutions across Indonesia using bitcoin. Over the years, Blossom has evolved from a Shariah microfinance investment intermediary to become a technology platform supporting a wider range of Shariah compliant financial services. Smart Sukuk™ is a prime demonstration of that transformation. While the idea of using blockchain to facilitate Sukuk offerings had been on the mind of Martin since 2014, he had placed it on the back-burner. “I had the idea since October 2014 when I founded Blossom, but the technology simply was not ready. People have been talking about smart contracts, but when I did the research, I found that the technology just wasn’t there,” Martin told IFN Fintech. It wasn’t until 2017 that Martin decided to revive the project. “The technology has become much more mature, there’s great liquidity in the market and it is good timing for investors,” Martin shared. The revival coincided with the emergence of blockchain platforms for the issuance of conventional bonds such as T-zero and Nivaura; simultaneously, research into the application of distributed ledger technology for Islamic financial contracts was picking up: Luxembourg-based Eethiq Advisors and its partner 570 AM and the University of Luxembourg’s SnT Interdisciplinary Center for Security, Reliability and Trust formed a strategic partnership toward the end of 2016 to develop a joint research program on blockchain technology and smart contracts for ethical and Islamic finance. Smart Sukuk™ is similar to smart bonds, but they diverge in the same way Sukuk diverge from bonds ie asset-backed or profit-sharing versus debt-based. “We’re now using an Ethereum smart contract to collect funds, issue ownership certificates to investors (using the ERC20 token standard), remit money from [overseas] into Indonesia, convert forex to rupiah, manage payment back to the investors, disburse payments appropriately based on relative ownership stake, and pay Blossom’s share of profits based on the agreement, plus secondary market tradability. All of this happens automatically using the blockchain rather than manual processes and human intervention,” explained Martin. What the Sukuk is not, is a bitcoin or cryptocurrency-linked Sukuk. In Smart Sukuk™, cryptocurrencies act as a wire in the transaction: the platform supports the offering of Sukuk in local currency and eliminates the need for institutions to add cryptocurrency to their balance sheet, therefore removing foreign currency risks on their books. Investors on the other hand, can buy the Sukuk using any currency of their choice (within Blossom’s list of 40 accepted tenders) including digital currencies. This is possible through a technological mechanism Martin calls a pricing oracle, a decentralized system determining the conversion rate between rupiah and ether. In other words, the returns on the Sukuk do not depend on the market price of cryptocurrencies, rather the returns hinge upon the performance of the underlying asset. In the case of Blossom’s first Smart Sukuk™, the performance of microfinance activities of the institutions in its portfolio. The first Smart Sukuk™ launched by Blossom is a Mudarabah-based facility underpinned by 80 microfinance institutions (MFIs) in central Java. Investing through its local partner, venture capital firm PBMT Ventura, proceeds raised from the first tranche of the profit-sharing Sukuk will be channelled into up to 80 out of 326 MFIs from PBMT’s network allowing these MFIs to fund micro-businesses or social enterprises with the goal of reducing poverty in the region. Carrying an expected annual net return of about 6%, the first tranche is a six-month facility with a size of up to US$5 million. Martin expects to issue the Mudarabah paper before October. Like the traditional Sukuk arrangement, Smart Sukukholders own a portion of the underlying assets or structure and would receive periodic payments (monthly or quarterly) from the issuer. Holders have the option to hold the Sukuk until maturity or sell their ownership to a third-party. “We plan to announce a secondary market trading solution within the next three to six months. The secondary market trades will only be allowed for approved, non-US parties. At this time, US-based investors will not be allowed to conduct secondary market trades or transfer of their securities,” shared Martin. In the pipeline are Sukuk based on the concepts of Ijarah and Istisnah, designed to fund larger projects, particularly construction projects; these Sukuk would be longer term facilities as opposed to the Mudarabah structure which would carry maturities between six to 24 months. A specific date for the Sukuk Ijarah/Istisnah has not been set although negotiations are ongoing with several potential Indonesian issuers. 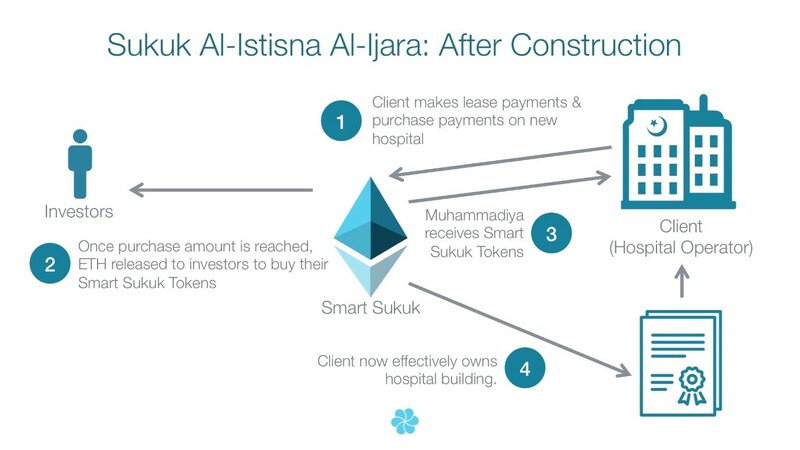 “It all depends on when they want to break ground; we’re excited because it will be a Sukuk on the blockchain that will be backed by hospital buildings,” revealed Martin, adding that the hospitals would be Waqaf (endowment) hospitals. It must be noted that Blossom did not secure a Fatwa for the Smart Sukuk Mudarabah; it instead relies on the fact that the structure is a pure profit-sharing model, which is permissible in Shariah, and leverages PBMT Ventura’s Shariah board. The start-up also conducted its own Shariah permissibility research on blockchain. The vision for Smart Sukuk™ is for it to be an international offering unhindered by geographical limitations and income brackets but local regulations make it difficult for the Sukuk to be available to the masses. As a foreign-held entity, Blossom, which is incorporated in Delaware, cannot raise funds from the Indonesian public directly, thereby alienating the world’s most populous Muslim nation from investing. “We are not offering to domestic investors at the moment, but it is definitely a possibility to allow Indonesians participate,” said Martin. One way to circumvent this regulatory hurdle, is to partner with a local entity authorized to collect funds from the public. Technically, Blossom could do it through PBMT Ventura, its local partner. Indonesians aside, through the MFI Sukuk, Blossom is investing as a foreign entity and is structured very similar to a venture capital fund complying with US securities law. It is a limited partnership of which accredited investors (high net worth individuals) can become limited partners upon investing, but it is not allowed to receive investment from non-accredited US investors. This means, retail investors, who form the bulk of inquiries Blossom has received, cannot participate in the Sukuk sale. “We have figured out a regulatory regime that allows us to fundraise from non-accredited individuals but it still excludes US individuals,” said Martin. Then there is the issue of tax. A 15% withholding tax is incurred before profits are repatriated to foreign investors, which would eat into returns, and likely turn away investors – especially institutional. What it means to the industry? Blossom’s Smart Sukuk™ may not be a true global offering as envisioned but it is a strong start. As the global Sukuk industry’s first real blockchain use case, it provides valuable lessons on how Sukuk can be offered on the blockchain, potentially paving the way for other issuers, in other jurisdictions, to follow suit and/or enhance on the process. The impact of blockchain Sukuk could be significant and is likely to influence the efficiency of the issuance process (such as time to market), and also widen both the issuer and investor base. Unlike in the traditional bond and Sukuk market, issuers of Smart Sukuk can raise notes as small as US$20,000. The digitization of the Sukuk offering process means cost for structuring could be eliminated. Add on a true profit-sharing layer, facilitators of the Sukuk would only be paid based on a pre-agreed ratio if investors make a profit. For example, under the Mudarabah arrangement, Blossom only makes money when Sukukholders make money – 20% of their profit. In other words, the barriers to entry into the Sukuk market could be lowered significantly. Execution-wise, the procedure is also more efficient. The technology allows for instantaneous settlement and by adhering to the ERC20 token standard, operational risk is lowered. “It is important because the Sukuk structures are fantastic, unfortunately, not all issuers can raise Sukuk. A lot of issuers would issue Sukuk if we can bring the cost to issue down. Here’s an example, where technology can standardize not only structures and contracts but also management of international remittance, forex, payment, registration ownership and tradability,” explained Martin.